Location: Rousse is the fifth largest city in Bulgaria and the biggest city in the country on the bank of the Danube River. 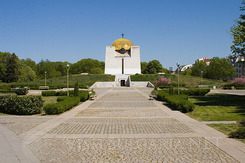 It is a situated 320 km away from the capital of Bulgaria- Sofia and 203 km from Varna. The city is also called “The small Vienna”, because of its unique ancient architecture. History: Prehistoric Thracian village existed in the site before more than 5000 years. During the 70 years after Christ the roman Emperor Vespasian built the very well fortified town Sexaginta Prista (The port of the 60 ships). During the 6th century the town was devastated by the avars. Later on the settlement was restored under the name Rousse, named after the holiday Roussalii. After the Christianization of Bulgaria the city’s patron became St George the town is renamed in Giurgevgrad. In the 13th century a bridge facility was constructed and the chronicles report the names of Golyamo and Malko Giurgevo (Big and Small Giurgevo) or today’s Rousse and Giurgevo. Today Gurgevo is a town in Romania on the northern bank of the Danube River. During the ottoman rule the town bears the name Rustchuk and is a centre of the Danube vilate. During the Renaissance period Rousse and its citizens are giving a serious push the modernization of Bulgaria. Many big Austrian- Hungarian ships are stopping in local port bringing western impact in the local culture. Thus the local citizens are the first Bulgarians, wearing clothes according to the European fashion standards. The architecture also has a serious development, as many buildings were being constructed according to Austrian- Hungarian models, and today are architectural monuments. Rousse soon receives European appearance, and as a border town free ideas from Europe are very well positioned. 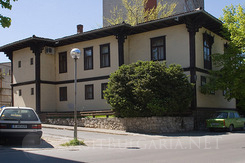 That is how Rousse becomes the cultural- educational revolutionary and business centre of Bulgaria during that period. 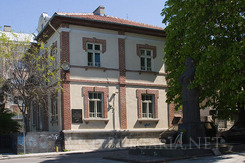 The house of Baba Tonka, who hid the apostol of liberty- Vasil Levski and many other revolutionists still stands as a national monument in the town. The local community centre Zora is one of the hearths for national struggle. Since 1866 the first meteorological studies in Bulgaria start operating in the town, helped by contemporary Austrian apparatus. During the same year the first railway from Varna to Rousse was completed. After the liberation of Bulgaria Rousse becomes the biggest town in the Bulgaria Kingdom. The Bulgarian navy started operating in Rousse on 31 July 1879. The first Bulgarian Bank “Girdap” and the firs navy technical school, later moved in Varna opened doors in the city in 1881. 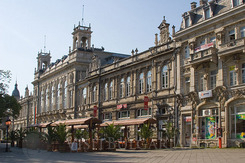 The first trade chamber and Insurance Joint Stock Company Bulgaria also opened in the town. May architects and continue taking care for the development of the liberated town. In 1954 the Danube bridge, that connects the Bulgarian and Romanian banks was constructed and the significance of the city for the country. Sightseeing: Almost 200 buildings in Rousse are included in the list for historical and architectural inheritance. The Dohodno building was build in 1902 and the liberty monument was officially opened in 1908. The first was built in German classic style and the monument is unique creation of the Florentine architect and sculptor Arlondo Tsoki. The museums in the city are numerous: The Pantheon of the Renaissance men, the City’s historical museum, Baba Tonka museum, Museum of the city’s style and living standards in the Kaliopa’s house, the National museum of transport and communications and etc. The Leventabiya fortress, the door of Mitiriza, Mahamudova column, the “St. Trinity” Church and the Flotilla fortress are also attractions in the city. Rousse is a big and modern city with live nightlife, many night clubs and restaurants that suite even the most sophisticated taste. You can receive more information in the Tourism Information centre Rousse.